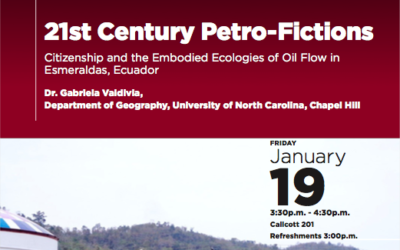 Hosted by the Department of Geography and the Walker Institute, this colloquium will feature Gabriela Valdivia from UNC-Chapel Hill, who will speak about oil production and resource nationalism in Ecuador. The event will be held on Friday, January 19th from 3:30p.m. – 4:30p.m., with refreshments at 3:00p.m. in Callcot 201.